The UK and Ireland are home to many fantastic charities, all doing great and deserving work. Supporting such charities is a positive process both for individuals and businesses. At Card Connection, we believe in spreading this support around, so we begin each year by asking our staff to put forward suggestions of the charities that mean the most to them, then we take a company-wide vote on which ones we’ll support in the year ahead. Our efforts began back in April 2018 with a focus on mental health, with our head office staff dressing up as superheroes – a fun event fuelled by a bring-and-buy cake sale. 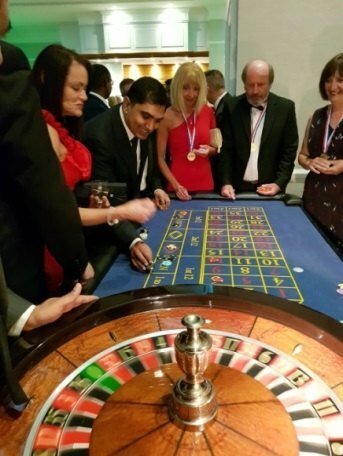 It continued in May, at Card Connection’s Annual Conference with sales of chips at our pop-up casino. The two events raised £432, split evenly between MIND, The Scottish Association for Mental Health, plus the Irish charities Inspire Wellbeing and Mental Health Ireland. 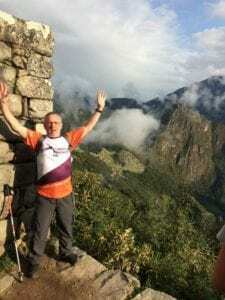 Also back in April, Card Connection Franchisee Steve Sanders headed to Nepal and risked altitude sickness to trek up to Everest Base Camp, a mere 17,600 feet above sea level! His efforts in support of Alzheimer’s Research UK raised £600. Back at Card Connection, our next event was timed to coincide with Remembrance Sunday and was in aid of Help for Heroes. With our offices overlooking Farnham War Memorial and with several armed forces bases within a 5 mile radius of Farnham, our staff have more daily reminders than most people of the importance of this charity. After joining the local dignitaries at the memorial in observing the two minutes silence, staff then went back inside to raise some money for this worthy cause. A remembrance-themed quiz and patriotic cake sale raised another £118. As the year drew to a close, December brought yet more dressing up fun for Card Connection Staff. 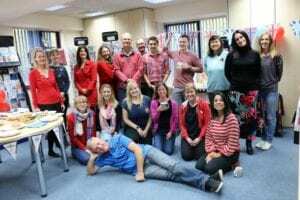 Donning their very best (or should that be their worst) Christmas jumpers, they enjoyed yet more lovely charity cakes and other festive treats. This time it was the Alzheimer’s Society who became the beneficiary, receiving over £70. Our last charity story was provided by our Northern Irish franchisee Gabriel McGeown. He and his trusty team took time out from his busy Christmas merchandising schedule to give something back to society. 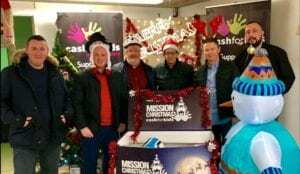 They volunteered for Mission Christmas Cash for Kids, a charity which aims to give something to kids at Christmas who may otherwise go without.